This set contains all the music from the five discs released between 2010 and 2017 of music from the Peterhouse partbooks. The package includes a new, 84-page unified booklet. Release date: October 5, 2018. 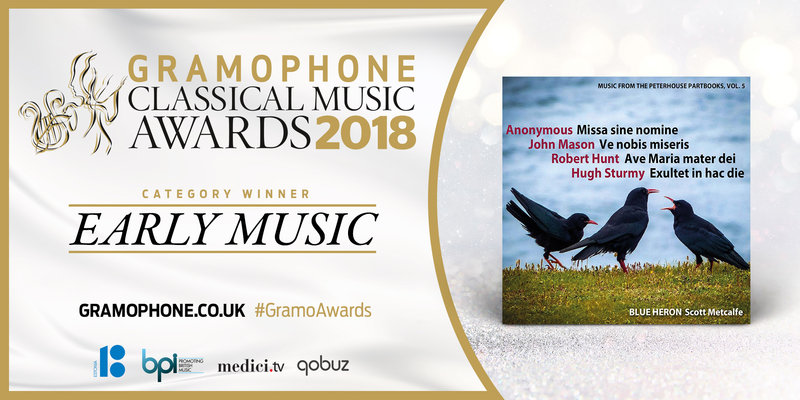 The fifth installment in Blue Heron’s 5-CD series of Music from the Peterhouse Partbooks won the 2018 Gramophone Classical Music Award for Early Music, and features a Mass by an anonymous composer and works of Hugh Sturmy, John Mason, and Robert Hunt. The fourth installment in Blue Heron’s 5-CD series of Music from the Peterhouse Partbooks features Jones’s only Mass, an antiphon by Nicholas Ludford and a Stabat mater by Robert Hunt. Christmas in Medieval England allows listeners to share the beauty, excitement, intensity and variety found in a Blue Heron concert performance. It includes plainchant, carols, and other music for Advent and Christmas from 15th-century England. It is comprised entirely of tracks recorded live at First Church in Cambridge, Congregational in December 2013.